Happy 30th Birthday Jennifer Hudson! The American Idol contestant rose to fame after winning an Oscar for Best Supporting Actress in "Dreamgirls." Her album, "Jennifer Hudson," released in 2008, won her a Grammy. She is well known for her weight loss, too. Hudson is a spokesperson for Weight Watchers which most likely means she doesn't eat a lot of candy, if any at all. So she wouldn't be one of our best customers, but we love her anyway. Most 30 year olds who aren't in the limelight like to indulge in candy goodness, so we recommend this special box of birthday candy that someone born in 1981 would remember from their childhood. It has forty kinds of nostalgic candy including Warheads, Candy Buttons on Paper, Big League Chew, Spree, Pop Rocks, Razzles, Candy Cigarettes, Nerds, Candy Necklace, Pixy Stix, Gummy Bears, Sour Patch Kids, and Swedish Fish. This collection of candy will take any thirty year old on a trip down memory lane! A box of old time candy makes a really fun birthday present, and is also great for a party because there's plenty of candy to share with everyone. 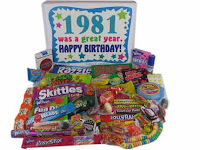 If you know someone who's about to turn 30, help them celebrate with a blast to the past with candy memories. We're sorry Jennifer Hudson won't be celebrating her 30th birthday with candy!